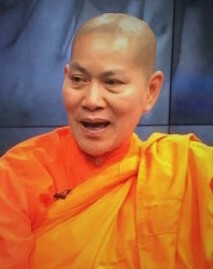 Suthasinee was born in1959. She started doing hands-on work in the social sector in her early twenties when she went to work with village hill tribes in Mae Hong Son, where she stayed for nearly ten years. She then worked with poor children in Kanchanaburi province and later in Bangkok with slum children through the Children in Slums Foundation. It was through this organization that she was first exposed to the problems of drug addiction amongst children. When she married and moved to her husband's home town of Yasothon, she saw the increasing problem of drugs there, too, and simply decided to set about doing something about it. Suthasinee Noi-in is better known by her nickname Mae Tiew among the AIDS/HIV orphans living in Home Hug Orphanage. Although she established it in 1987, it took her more than ten years to turn what was once a makeshift shelter into a properly run orphanage in Yasothon province, in northeastern Thailand. Suthasinee’s devotion to her cause came under the national limelight in 2007 when her story was turned into a TV commercial for a life insurance company. The popular ad showed her dedicating herself to maintaining and supporting these children despite suffering from cancer herself. But “fragile” is not a word you would use to describe this smiling, average-sized 54-year-old woman who seems to glow even without any make-up. If she were fragile, hundreds of children might not be alive today. Her desire to help others started over 25 years ago at university when she joined a volunteer camp to help poor farmers in the province. However, her inspiration went further back to her imperfect childhood. “Coming from a broken family, I grew up as a love-deficient child. But my parents taught me an important lesson—we should set a good example for the children instead of just repetitively telling them what to do. My father was my role model for making other people happy and my mother was a role model for sharing love with others,” she says. After obtaining a bachelor’s degree in psychology from Bangkok Technical College, Suthasinee decided to take a teaching job in the northernmost province of Mae Hong Son where her students were ethnic mountain people. Then she moved to Child Village in the westernmost province of Kanchanaburi. After that, she switched to work for a non-governmental organization that aimed to improve the quality of life of slum dwellers in the Khlongtoey District of Bangkok. During the course of working in the slum area, Suthasinee started to notice the great suffering of many poor HIV/AIDS-afflicted children who became orphans after one or both parents succumbed to the disease. This was especially prevalent among migrant workers from the northeastern part of Thailand. She decided to tackle the problem at the root cause by choosing to work in Yasothon province among the poorest areas in the country since that was where she attended camp during her university years. At present, Home Hug Orphanage accommodates around 87 children between the ages of three and the late teens. There were over 100 children last year but several succumbed to complications due to HIV/AIDS while others have completed their education. In addition to those living in the orphanage, Suthasinee also takes care of some children who still live with their parents at home. This iron lady been suffering from intestinal cancer for several years and goes for treatment from time to time. Although she is fighting hard with the disease, Suthasinee’s desire to help the children never falters. In 1992, Suthasinee founded the Project for Children and Youth. When a drug-addicted youth comes to the Project, she is met by a project officer and a trainer. These people explain to both the individual and family members that the Project will provide for all of the material needs of the patient, who will not be allowed to have any money at all during treatment, though visits by the family are allowed at least twice a month. All drug use ceases from this moment on, and no medication is used to alleviate the symptoms of withdrawal. In severe cases, patients are sent to a hospital and return later to complete treatment. Once past this stage, the program focuses on the mental condition of the patients by involving them in music, sport, reading and concentration exercises and by assigning them responsibilities for the upkeep of the center. They become part of the "family" at the Project, where patients and counselors use informal nicknames and assume nurturing, familial relations with one other. A highlight of the treatment is a week-long rehabilitation camp in the country or forest, which provides the setting for counseling which is a key part of Suthasinee's work.